French voters gave a resounding “Non” to President Nicolas Sarkozy in the first round of local elections in France on Sunday, as the ruling UMP party fell behind the opposition Socialists and close to the extreme- right National Front, which is now seen as a as a very real threat to the president in next year's presidential elections. The ruling party the UMP (Union for a popular Movement) had only 16% of the votes. The Socialist Party gained about 25% and the Front national 14% which is led by Marine Le Pen, daughter of Jean Marie le Pen. Turnout was low, at under 50%. Ms. Le Pen, who took over the National Front leadership in January, has smoothed the abrasive image that her father Jean-Marie, who has been convicted of inciting racial hatred and of minimizing the Holocaust. An opinion poll last week showed Ms. 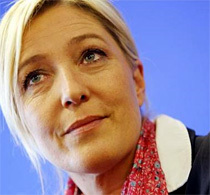 Le Pen, who has been playing on immigration concerns, would come in first if the first round of presidential elections were held now, ahead of Mr. Sarkozy and potential left-wing candidates. Another poll this week showed the National Front leader would rank close to Mr. Sarkozy if presidential elections were to take place this weekend. "This is the first step of a grand renewal to which French people aspire," Ms. Le Pen said in an interview on TV station France 2, noting that this was her party's best result yet in local elections. Mr. Sarkozy has struggled over the past year to rebuild the popularity that gave him the presidency in 2007. A stubbornly high unemployment rate, which was holding at 9.2% in the fourth quarter, and the unpopular reform of France's pension system dented his ratings in 2010. His attempts to recover by playing up popular right-wing themes have failed to make up the lost ground, leaving his approval rating hovering around 29%. A proposal to take French nationality away from people of foreign origin who commit certain crimes has stalled, and plans to pay gypsies to leave France met with outrage from unions, human-rights organizations and the opposition as well as from other European countries. Prime Minister François Fillon has hinted for the first time at the possibility that the UMP could be absent from the second round of next year's presidential vote, with Ms. Le Pen running against a Socialist candidate.